Chevy's eternally popular Suburban is the peak of the full-size SUV class, with impressive capabilities, inviting luxury, a host of refinements and a remarkable driving experience, all wrapped up in a commanding presence that owns the road in the looks department. With the exception of its General Motors sibling, the GMC Yukon, nothing else really matches up to the 2016 Suburban. There is lots of space in the vehicle for a growing family. This was our first car with a backup camera, so it took a little while to get used to it but I still tend to look around the old school way. The camera does come in handy when in park lots though. I love the little features of the car such as the little hidden space to store stuff in the dash by just pressing a button and the radio screen slides up and down. I really enjoy the extra USB plugs for charging my phone and connect to the hand free mode while still charging instead of wasting battery by just doing Bluetooth. Car has been very reliable since purchasing in 2016. My kids enjoy have separate seats with the captain chairs we opted for. When we do use the 3rd row it does help the person in the back who is sitting the middle to have that extra legroom from the aisle opening. Overall I enjoy the car especially for my growing family without having to go to a minivan (which my husband did not want to do if he didn't have to). Mechanically sound vehicle. I have had zero issues with any of the drivetrain. It isn't hard on tire. Oil changes are quite expensive because it uses a lot more oil than a car but I guess that goes along with everything about bigger vehicles, tires are more expensive, fuel, etc. I do have some complaints about the display features. You have to subscribe to Onstar and call them to program a destination to have turn by turn directions on the display. There is no independant navigation function. It brags to be compatible with your phone but it has some quirks. If you have an android phone you cannot cast your display onto the screen. If you have an apple phone the console charging pad does not work. 2016 Chevy suburban. Family of 6! The 2016 Chevrolet suburban fits our needs for a family of 6. The bucket seats offer space for my 5 year old twins to get to the back bench seats where they can put on their own seat belts. Also, speaking of 4 kids under 5, the rear storage is large enough to always have extra room for toting around strollers, groceries, or luggage during road trips. We also pull a family travel trailer with this vehicle, towing capacity seems a lot larger than what we needed but towing with it is average. Our trailer is approx. 4, 000 lbs with which the suburban does fine. It just does not like to go up hills very fast. 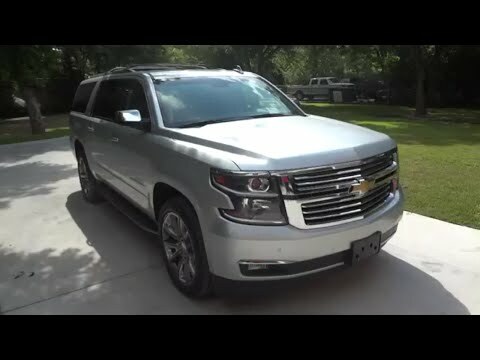 2016 CHEVROLET SUBURBAN LTZ REVIEW! !| IS IT THE BEST SUV EVER? ?